Robert Gillespie et.al., Buffalo, NY. 60hp engine by Allaire Works, New York City; engine from HENRY CLAY. Boilers by John Newman, Buffalo, NY. 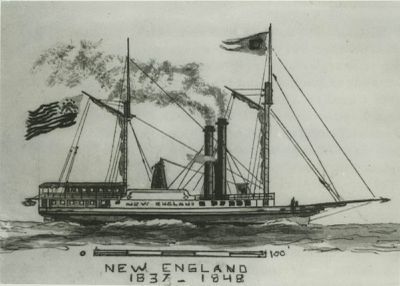 1837, May 18 Collision with Buffalo pier. 1837, May 26 Enrolled Buffalo, NY; cost $45,000; ran Buffalo - Toledo, OH & Detroit, MI. 1837, Jul 23 Collision with steamer NEW YORK at Dunkirk. 1838, Apr 25 Ashore, Detroit River; released. 1838, Nov 6 Stranded in gale off Fairport, OH with 1500 bushels flour & butter; jettisoned cargo & released in few days; repaired, Buffalo. 1839, Oct 1 Owned James C. Oatman, Buffalo. 1839, Oct 17 Lost wheel, Saginaw Bay. 1842, Nov 30 Disabled machinery; repaired, Fairport. 1843, Jul 17 Struck by lightning, Detroit; slight damage. 1846, Jan 16 Owned Charles Cook & Company, Buffalo. 1848, Nov 29 Ashore, Buffalo; released.